I have two new projects to share showcasing two new products. 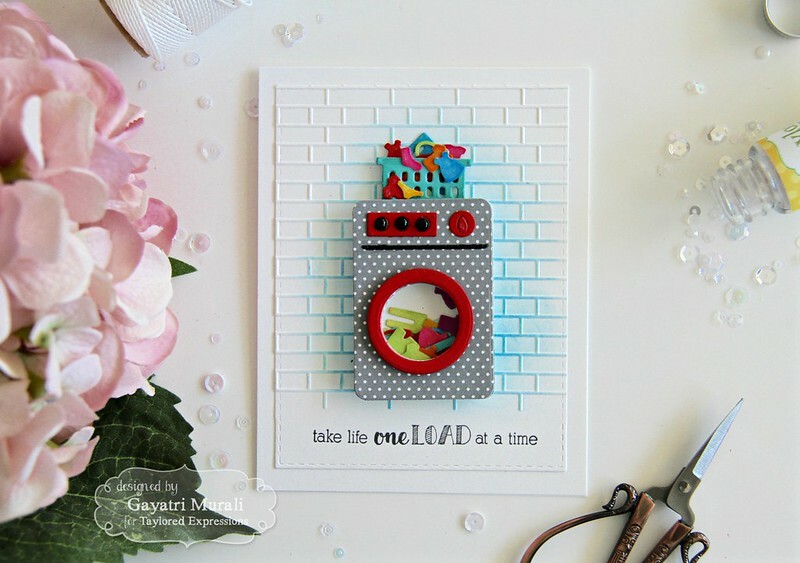 My first card showcases new die called Spin Cycle and Spin Cycle Sentiments along with Little Bits: Laundry Basket and Little Bits Clothing Confetti dies. This is a great set to have in your collection. I particularly love the sentiments on the stamp set. 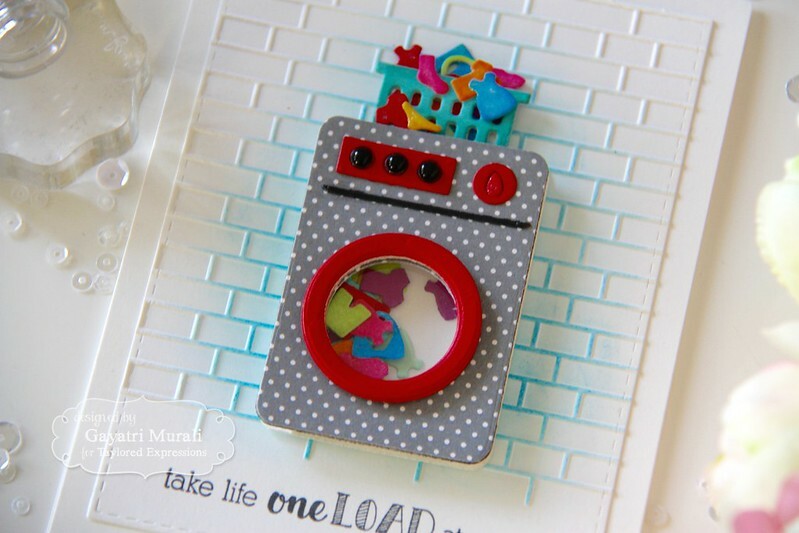 I used the Spin Cycle dies to create my washing machine which has shaker element with Little Bits Clothing Confetti in it. I also used the Little Bits Laundry Basket on top of the washing machine with Little Bits Clothing Confetti in the basket. For the background I used the new embossing folder Subway Tiles and sponged Cookie Monster TE dye ink. The sentiment is stamped below the embossed background. The panel is die cut using stitched rectangle die from Stitched Rectangle Stacklet. Here is the closeup of the card. Here are the list of supplies I used to make this card. The second product I am showcasing is called Sitting Pretty. 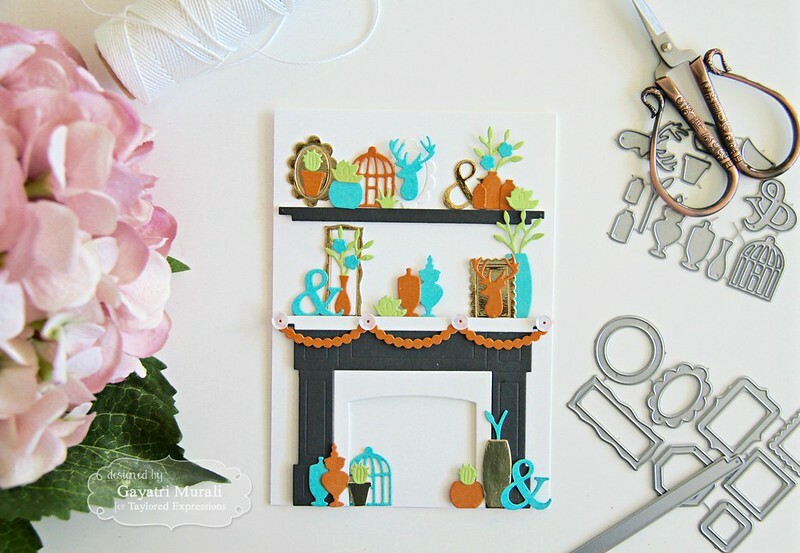 I am combining the Sitting Pretty die set with Sitting Pretty Accessories and an older die called By the Fireside. 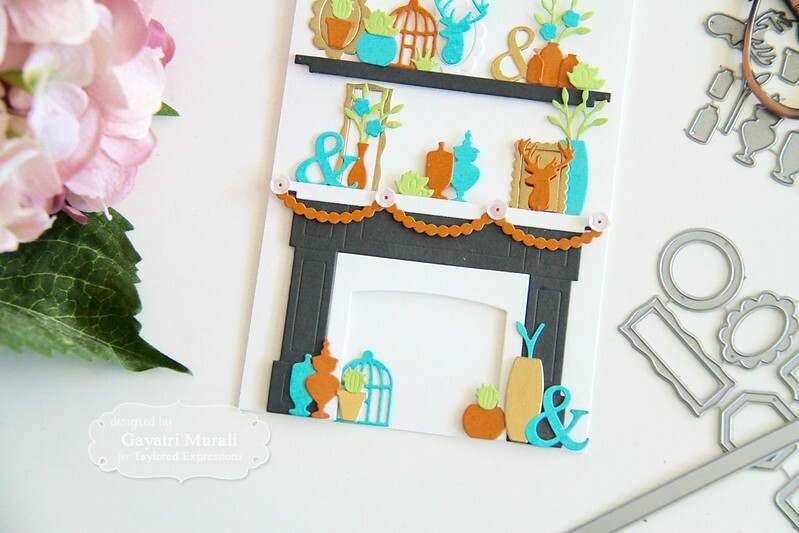 These dies create beautiful scenes on its own or combine with some of the build a scene dies from Taylored Expressions to create one. 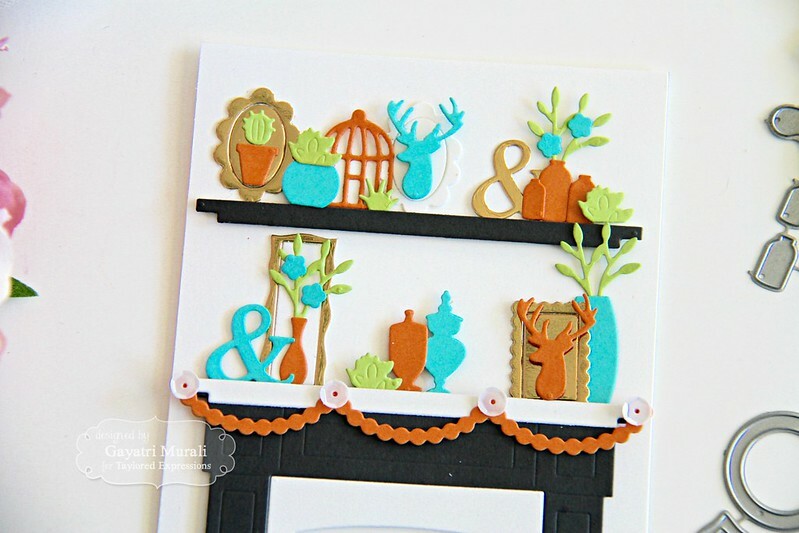 I have used By the Fireside die to create a gorgeous mantle decor scene. I used Poppy Seed, Cookie Monster, Candy Corn, Granny Smith, Sugar Cube TE cardstocks along with gold mirror cardstock to die cut the elements. I clustered the elements into a group of three and adhered on the ledge. I did the same at the bottom of the fireplace. I then die cut a banner from Skinny Mini Party Border dies to add a banner to the fireplace and a few sequins from Snow Flurries collection. I had so much fun die cutting and creating this scene. I absolutely adore this card. I did not add any sentiment as I wanted the mantle decor to the highlight of the card. I will personalise and added sentiment when I decide to send this card. Here are some closeup of the card. I will see you tomorrow with day #2 of sneak peek projects. wow, love how you made the washer polka dot!! You are so creative! The brick background is a touch of genius!